Uganda and Rwanda protect mountain Gorillas found in tropical and bamboo forests respectively. Mountain Gorillas spend most of their times up hills thus trekking in both countries need some level of fitness. In other words, one must be physically fit to successful track gorillas in Rwanda and Uganda. In both countries, trekkers are given a maximum of one hour with the gorillas –viewing, recording videos and photographing mountain gorillas. However, it should be noted that, meeting and looking into the eyes of a gorilla is unforgettable and life time event so, one hour is worth the amount paid for the Gorilla trekking permit. Visitors to the gorillas are advised to keep a distance of 7 meters from the gorillas in both Uganda and Rwanda. Before taking off for a gorilla trekking in Rwanda or Uganda, every one must purchase a gorilla permit to be allowed on the trekking excursion. The difference here is in the cost of the permits. Currently, Uganda Gorilla permit is sold at US$ 600 and Rwanda permit at US$ 750 – advance booking is a must and the payment is non refundable. In Both countries, Gorilla permits are on very high demand throughout the year – that is why tourists are advised to book their permits early. 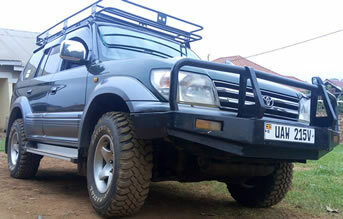 Gorilla permits can be booked through Tour Agents in Kigali or Kampala, or one can book direct with responsible bodies; Rwanda Development Board (RDB) and Uganda Wildlife Authority (UWA). Briefing about mountain gorillas and the trekking experience is a must before setting off for the trek- very early morning briefing at the head quarters, led by ranger guides – here visitors ate equipped with dos and don’ts while on the way and when with Gorillas in their natural habitat. In both Uganda and Rwanda, Gorillas are found in their natural setting – Uganda in Bwindi and Mgahinga Forests while in Rwanda, they are found in the bamboo forest of Volcanoes National Park. In both countries, gorilla trekking are conducted or led by rangers and security is tight while in the forest and a maximum of eight people are allowed to visit each Gorilla group, and porters are very important in both gorilla destinations. Every one is advised to hire a porter to assist you during the trek, he /she can push or pull you over the steep terrain in the jungle. Hiring a porter is one way to create employment opportunities, and you direct contribute to the conservation of the endangered gorillas and their natural habitat because, when porters are employed, the number of poachers reduce. In both countries, Gorillas form groups or families and each group is led by a male silverback. Gorilla tourism in both countries experience low and high season. Low seasons starts from April to May and from November to January annually. In peak seasons, gorilla permits are extremely higher than in low seasons. In both countries, the prices of accommodation in low seasons go down – few tourists travel to the parks for Gorillas trekking activity leading to low demand and low costs. However, in high seasons, the prices for park Lodges increase. Uganda and Rwanda citizens are given special discount for Gorilla tracking; Shs 250.000.00 and 30.000.00 frw respectively. Gorilla trekking is the major tourist attraction in both Uganda and Rwanda. In other words each country earns the biggest revenue from mountain gorilla safaris because majority of the tourists come mainly to track gorillas in Bwindi Impenetrable Forest, Mgahinga National Park in Uganda and / or Volcanoes National Park in Rwanda. While in Bwindi Impenetrable Forest and Mgahinga National Park, visitors view Virunga mountain ranges which are similar to Volcanoes National Park. The three Gorilla parks in two countries provide a wonderful view for excellent photographing. 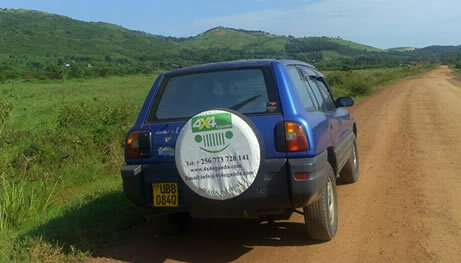 Mgahinga, Bwindi and Volcanoes National Parks are situated in mountainous regions – temperatures are low during nights because of high altitudes. Cost of Gorilla Tracking Permits: The cost varies depending on one’s nationality. In Uganda foreign non residents pay US$600 and US$750 in Rwanda. Foreign residents living and working in any of East African countries (Uganda, Kenya, Tanzania and Burundi) pay US$475 for Rwanda permits, while foreign residents living within Rwanda pay US$300 each for gorilla permits. Gorilla Permit Promotions: Uganda offers discounts on gorilla permits in low seasons from US$350 for foreign non residents unlike Rwanda. This happens in April, May and November. However, you are advised to first consult your travel agent about the promotion because things may change any time without notice. Driving Distances / time to the gorilla parks: Access to Volcanoes National Park Rwanda is much easier for only 2 hours drive (Approximately 100 km) from Kigali city / Kanombe International Airport. However, driving distance from Kampala capital / Entebbe International Airport in Uganda to Bwindi Impenetrable Forest / Mgahinga National Park takes between 8 – 10 hours (Over 5oo km). Number of Mountain Gorillas: According to the 2011 gorilla census report, there are only 880 mountain gorillas in the world. Half of this population is found in Bwindi Impenetrable national park in Uganda. The rest of the population is found in Virunga mountain ranges shared by Rwnada (Volcanoes National Park), Uganda (Mgahinga National Park) and Democratic Republic of Congo (Virunga National park). This means Uganda has more mountain gorillas than Rwanda. 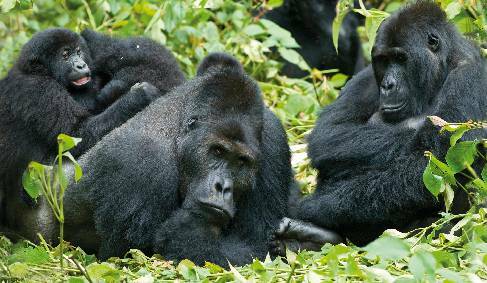 Number of habituated gorilla groups: Uganda has more habituated gorilla families than Rwanda, with about 15 groups, yet Rwanda has only 10 groups. Visit www.rwandasafarigorilla.com for more information about mountain gorilla tourism in Rwanda and Uganda – Africa.